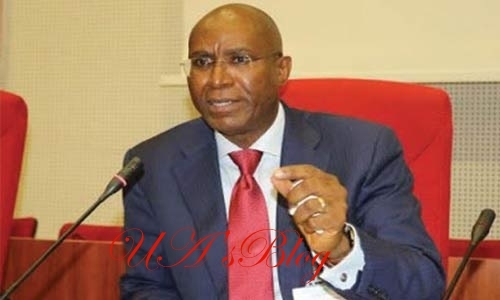 The Federal High Court in Abuja has rejected an ex parte application filed by the Delta Central senator, Ovie Omo-Agege, to stop his suspension by the Senate. He had, on April 3, filed the ex-parte application before Justice Nnamdi Dimgba, asking the court to order that “all further proceedings against the plaintiff (the senator) in respect of the allegations referred to the first defendant’s (Senate’s) Committee for Ethics, Privileges and Public Petition” be halted pending the hearing and determination of his main suit. The defendants to the suit are the Senate, the Senate President, Dr. Bukola Saraki, and the Attorney-General of the Federation, Mr. Abubakar Malami (SAN). But the Senate on Thursday suspended the senator for 90 days over his comment that the amendment to the Electoral Act 2010 to reorder the sequence of polls in a general election was targeted at President Muhammadu Buhari. This came after the Federal High Court in Abuja had, on Wednesday, rejected his ex-parte application requesting that parties be ordered to maintain status quo by suspending all actions concerning the issues raised in respect of the case. On Wednesday, Omo-Agege’s lawyer, Mr. E.R. Emukpoeuo, had moved his client’s ex parte application filed before Justice Nnamdi Dimgba on April 3, 2017. Ruling, however, Justice Dimgba refused to grant the order, directing the parties to maintain status quo.